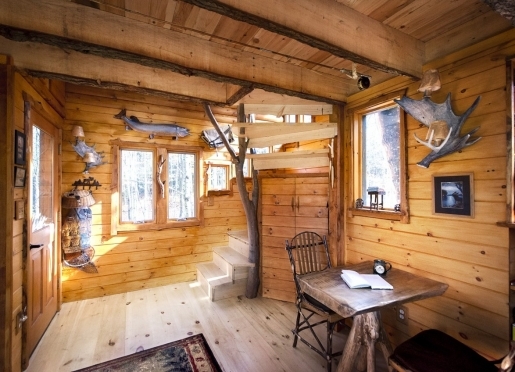 Welcome to the Moose Meadow Lodge & Treehouse! Nestled on 86 secluded acres in the Green Mountains in Waterbury, VT , the Adirondack style Moose Meadow Lodge in Waterbury, Vermont invites you to enjoy a truly unique B&B experience. Make yourselves at home and enjoy the peace and serenity of our secluded property. 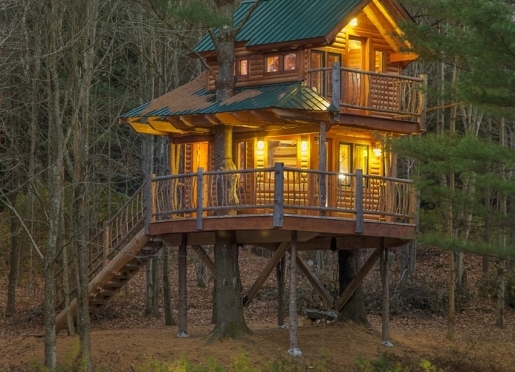 Along with four luxury guest rooms and our 2-story Treehouse, the property includes a hot tub, hiking trails, a trout pond, and the Sky Loft - a glass-enclosed gazebo at the highest point of the property with panoramic views. Whether you love skiing, hiking, snowmobiling, biking, hunting, fishing, antiquing, fine dining, the arts, or simply getting some rest, the Moose Meadow Lodge is a perfect location to do everything or nothing at all. A Vermont log cabin like no other, the Moose Meadow Lodge is close to Vermont's most popular attractions, including Ben & Jerry's Ice Cream factory, and the ski resorts of Stowe, Sugarbush, Bolton, and Mad River Glen. The friendly village of Waterbury, where you'll find everything you need, is only three miles away. Lodge is always a special time. Travelers are always looking for memorable and relaxing experiences. Let’s discover more through the words of our innkeepers. Many thanks to Willie Docto and Greg Trulson for sharing their own secrets with BBOnline.com! The Moose Meadow Lodge is a destination B&B. 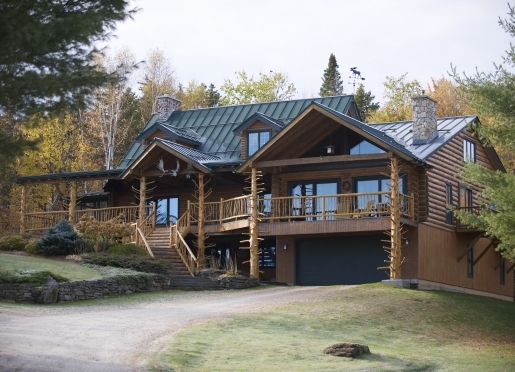 We offer a luxury log home experience on 86 acres and mountain views that is hard to find anywhere else in Vermont or dare we say the country.Our guests find that the serenity of the natural surroundings takes them to a space that is unlike their usual hectic environment. 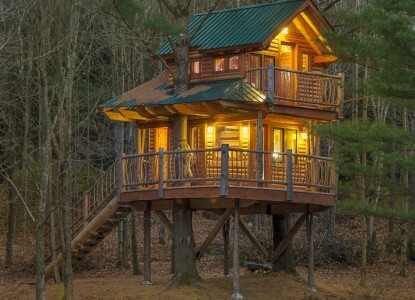 We're best known for being a couple of things.One is our new 2-story Treehouse, which is redefining "glamping" in Vermont.Secondly, we're a top gay wedding destination, having hosted the first gay wedding in Vermont and the first military wedding in the country. What makes us unique is that we don't fit any kind of mold.We welcome people from all walks of life from all over the country and the world.People feel welcome, comfortable and safe here. What I love the most about my B&B is that it's continuously improving and transforming.The innovations we make constantly surprise and please our guests, even those longtime repeats. Ben & Jerry's Ice Cream Factory is number 1, but also The Alchemist brewery is a very close 2nd. Because of a spiritual connection, guests have requested their ashes be spread on our property. The welcoming, open-minded, accepting people who live and work here. EAT:We have tasting tours that include cheese, wine, beer, cider, cider donuts and more. We have a wide range of restaurants from casual pubs to haute-cuisine.Farm-to-table is a way of life here. MOVE:We are close to four ski resorts, hiking trails, mountain bike trails, ice skating,There's no shortage of recreational activities. REST:Get a massage. Soak in the hot tub. Nap on the hammock by the pond. We are 3 miles from the town of Waterbury, so a car is highly recommended.On property we have 86 acres with hiking trails to enjoy all year.We even supply snow shoes. We enjoy all the restaurants in the area. All the food is great. www.waterbury.org provides a comprehensive guide for the area. No. I'm highly allergic to pets. We direct people with pets to Stowe Cabins in the Woods or Inky Dinky Oink Ink in Stowe. 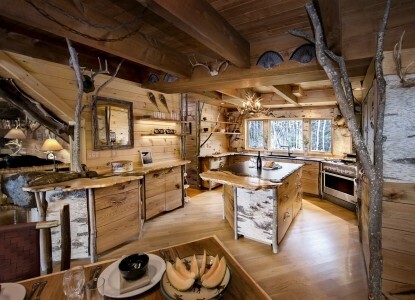 A mix of rustic furnishings and contemporary comforts welcome you at the Moose Meadow Lodge. The living room's rustic charm and wood burning stove make it the perfect place to cuddle up with your favorite person or your favorite book. 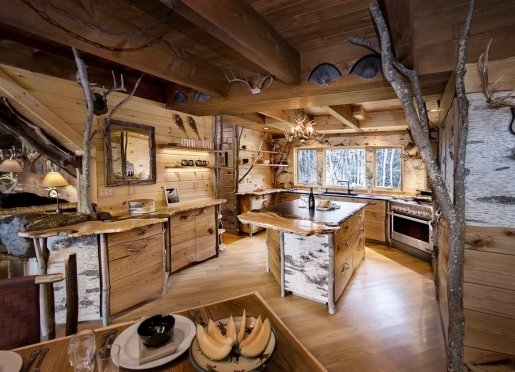 Decorated with deer antler lamps, fly fishing rods, Amish twig rocking chairs and other Adirondack elements, the living room is as casual as it is comfortable. The Great Room, is where guests like to listen to music, watch videos, or play games while enjoying the mountain views. We offer nearly 500 channels on digital cable. Full length glass windows in the dining room provide every guest a window seat. Feast your eyes on spectacular views while enjoying a sumptuous breakfast. We're sure you won't find any place in Vermont that's quite like the Moose Meadow Lodge with it's rustic log style and modern conveniences. Enjoy our international collection of wildlife trophies, including our signature 19-point moose, wild turkey, pheasant, deer, black bear, and perhaps the only African water buffalo in a Vermont B&B.Many of the furnishings were created by co-owner Greg Trulson. Breakfast is served each morning, and may include buckwheat pancakes with blueberry maple syrup, Belgian waffles, eggs Benedict or our special Grand Marnier French Toast topped with Ben & Jerry's vanilla ice cream. We serve delicious coffees from Green Mountain Coffee Roasters and unique teas and herbals from the Vermont Liberty Tea Company - both companies based in Waterbury. Breakfast is served at 9:00 am. Please inform us in advance about any dietary restrictions, allergies, etc. We're dedicated to making your stay at the Moose Meadow Lodge a comfortable and enjoyable experience. That's why we've made every effort to provide all the amenities you've come to expect from a B&B and more. Consider the Moose Meadow Lodge for your wedding celebration. The unique Adirondack-style architecture and decor of the Lodge, the spectacular views, secluded natural surroundings, and Vermont hospitality will make your event truly special. We specialize in intimate weddings for 2 - 30. For larger events, please contact us for more information. Do you have a civil union license, but want a civil marriage license? Or do you want to renew your wedding vows? Waterbury, Vermont is centrally located for enjoying the area's most popular destinations, events, activities, and entertainment. Waterbury is the gateway to all types of recreation and is home to some of the world's best specialty food companies. Here are just a few favorites of our guests. Get ski conditions for Vermont. Take Exit 10 (Waterbury) or Exit 9 (Middlesex) off US I-89. At Snowfire Auto dealership, turn onto Route 100 South. Note your odometer reading at this point!!! Look for the right-turn yellow sign, then slow down. Turn RIGHT onto Crossett Hill Road. Proceed up the steep hill 0.6 mi/1.0 km. Mailbox 607 is on the left. Do not turn left onto Birch Street. Our mailbox is just past Birch Street. Note: Crossett Hill makes a big "horseshoe" off Route 100. Be sure to follow exactly the directions above or below. Proceed about 0.8 mi/1.2 km. Just past the Middle School, TURN RIGHT onto Crossett Hill Road. Stay on Crossett Hill Road for 3 miles. Do not turn on any of the side roads. Look for 607 on our mailbox. It will be on your right. At the intersection with Route 100-B turn LEFT to stay on Route 100 North towards Waterbury. Look for Irving Gas Station/Duxbury Country Store. Proceed 1.5 miles past this point. Look for a very steep road on the left. This is Crossett Hill Road. Turn LEFT up this steep road. Proceed up Crossett Hill for 0.6 mi/1.0 km. Mailbox 607 is on the left. If it is snowy or muddy, use the other directions above. Please Note: Some GPS units take you to the other end of Crossett Hill near the intersection with Morse Road. We are about 2.5 miles from Morse Road. You may use the following coordinates: North 44° - 18' - 18.2" / West 72° - 46' - 53.6"
If you do not have reservations, please make an appointment to see the Moose Meadow Lodge. Check-in is 4-6 pm. Check-out is 11 am. In order to properly prepare the Lodge in time for incoming guests, we appreciate your cooperation. Thank you.